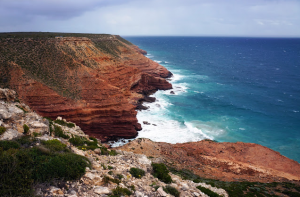 One of Western Australia’s most spectacular coastal walks, the Bigurda Trail takes visitors along an 8km stretch of coastal cliffs in Kalbarri National Park. Linking Eagle Gorge to the Natural Bridge, this moderately easy trail features incredible views of the region’s rugged, banded cliffs juxtaposed by wildflowers in a myriad of colours. A fairly unique experience, this is an essential walk of Australia’s Coral Coast. The trail begins south of Kalbarri at Eagle Gorge and continues for 8 km, reaching the Natural Bridge, taking approximately 3-5 hours. It is marked with pegs along the way, which feature the Bigurda, which is Nhanda for a Common Wallaroo, also known as the euro (Macropus robustus). This trail is suitable for most ages and fitness levels, although some bushwalking experience is recommended. Along this trail, the Indian Ocean butts up against the ancient Australian landmass, creating steep chasms, rocky inlets and bizarre formations, as it relentlessly carves away at the multi-coloured layers of sandstone and limestone. This moderately easy trail features banded cliffs juxtaposed by spectacular wildflowers from winter through to the end of spring, and unique flora and fauna protected within the Kalbarri National Park. From July to November you may even spot migrating humpack whales, and dolphin pods.